This is pretty simple card...the base is Daffodil Delight, a wee bit over 6" x 3 3/4". I stamped the sun from Kinda Eclectic in So Saffron and the Jenni Bowlin silhouette in Basic Black. Since the card was an odd measurement, I also made a custom envelope for it in the same sunshiney colors! The design team has a lot of fun takes on Sandy's challenge! 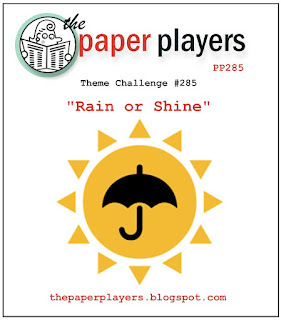 Be sure to check them out below and show us yours as well on the Paper Players blog! Thanks for stopping by today and enjoy your day! You certainly can fly anything when it comes to stamping! This is adorable! Love the silhouette girl and the paper is sweet! I think Casssidy and Emma would have a great time together in our craft spaces! Darling little kites, and, yes certainly a favorite thought in Spring! Gorgeous card, LeAnne!! Love your take on the theme - your kites are lovely and I love the different patterns you combined. I'm so sad tonight is the last Downton Abbey episode. :( Like you, I'm hopeful that every story line ends happily and we are all left with a content feeling. Although, I'm still very disappointed that there will not be something to look forward to. *sigh* I haven't been able to get into any of the other PBS or BBC shows. LeAnne, what a wonderful, sunny scene you have created. I love that you stamped the silhouette in black, it really pops from the page. Love the use of the kites. Really reminds me of Summer. What a perfectly delightful card LeAnne!! The kites are playful and the silhouette so cute. Speaking of cute...that would be Miss C!! Your card brings back some fun memories..we always got kites in out Easter baskets..so fun! That silhouette is SO cute. Cassidy looks like she's having fun! Love these sweet little kites bursting over the card! Such a cute layout and I love the little girl silhouette. So cute, LeAnne! Awesome sunshiny card, LeAnne! That paper is awesome and I love all the kites, and the silhouette of the little girl just perfect. Cassidy is looks so grown up, grown up enough to use Grammie's markers! Kites certainly mean spring and sunshine. Such a cute and sunny looking card. I'm envious of how you use stamped images with patterned paper and make them look like they were meant to be together. Love this! A card that makes me want to get out and enjoy the lovely outdoors!